Our still-fresh DECENT Voting Tool received a version upgrade last month, which introduced a bunch of new features, performance upgrades and bug fixes. From the highly positive feedback we’ve received so far, our users consider the tool very user-friendly and can’t wait to see what further upgrades we have in store for them. As you probably already know, DCore uses a model called Delegated Proof of Stake (DPoS) to achieve consensus. In comparison to other blockchains, DPoS, is faster, less energy intensive and more efficient. Voting for the number of active miners – also called Advanced Voting. Why Vote for the Number of Active Miners? The minimum number of active miners is 11 and the maximum is currently set to 1001. As of Aug 30, 2018, the number is currently at 31. So, how does the network benefit if a user votes for the number of active miners? How can changing the number of active miners affect the network? First and foremost, what you don’t want is just a handful of people reigning over the network and controlling how it operates. Ideally, since DPoS is built to be a democratic system, there would be a consensus among all the voters regarding the number of active miners which would be best for maintaining the blockchain platform. A lesser number of miners (e.g. 11) could mean that if more than 1 or 2 miners had connectivity issues, there could be severe repercussions affecting the way the network works (e.g. blocks being skipped, delayed transactions, etc.). A higher number of active miners would protect the network against these types of situations and also create greater decentralization for the network as a whole. Voters should be conscious of their choices when selecting active miners and only vote for reliable choices. All holders of DCT have the option to vote on how many active miners there are – meaning, anyone with DCTs in their wallet can vote. However, the more DCT you have in your wallet, the stronger your vote is. Moreover, the maximum amount of active miners you can choose is the number of miners you had previously voted for (you can still vote for a lesser number, of course). Tip: When voting for miners, it’s always a good idea to read their proposals next to their account name (if they have one). Through this proposal, you may learn a miner’s motives, what configuration they have to secure 24/7 availability, or even whether they have plans for creating a project beneficial for DECENT. The whole process is super easy. 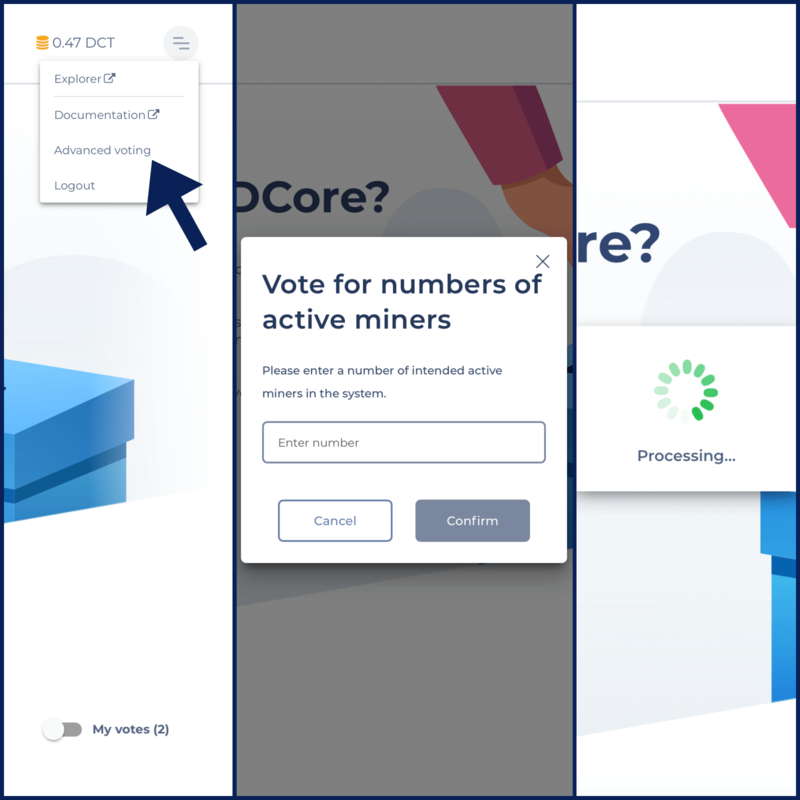 Select “Advanced Voting” from the drop-down menu after logging into https://voting.decent.ch with your credentials, enter the number of miners you want to be active and press “Confirm”. And voila, that’s it! Once you vote for the number of active miners, your choice is recorded but can still be changed anytime. An insignificant amount of DCT will be subtracted everytime you perform the initial voting or a change. The amount subtracted from your account when using the Advanced Voting feature is always 0.005 DCT, no matter how many active miners you select. Remember that as long as you have DCT in your account wallet, your vote(s) for whichever miner(s) you chose will stay valid. We do, however, suggest checking the status/condition of miners you vote for from time to time just to make sure your vote still counts for the right person. If you want to get a more technical overview, please see our DCore Documentation. We are happy to see so many of you interested in our voting tool. There is so much still to come and we want you to be part of it. Also, our DECENT Wallet has been extensively tested for the past few weeks and will be released very soon. We will keep you posted. If you want to stay up-to-date with the latest news about DECENT, follow us on social media and join our Telegram.